FATALITIES involving truck drivers on the South Eastern Freeway are inevitable without clarity over the use of brakes during descent, the state's heavy transport peak body says. 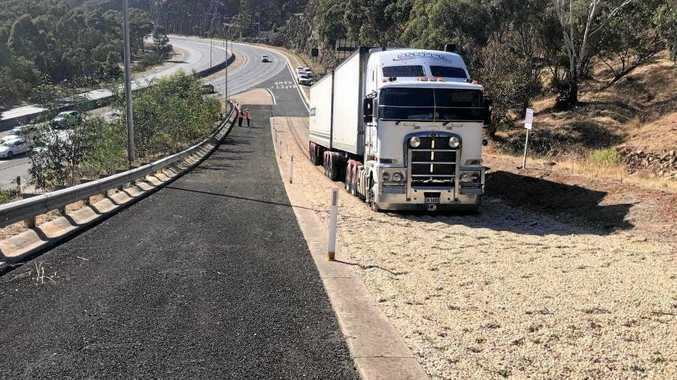 The Advertiser reported that South Australian Road Transport Association executive director Steve Shearer has warned truck drivers are scared to use their brakes on steep descents over fears of "astronomical” penalties that will come into effect on May 1. Under the new penalties, drivers can lose their licence for six months, lose six demerit points and face $1000 fines if they are caught in the wrong gear or speeding. The warning follows a near miss on the South Eastern Freeway when a truck driver avoided a pile-up disaster by ploughing into the lower arrester bed. Mr Shearer later took to the association's Facebook page to air his frustrations and outline the association's position. He said under the Act, drivers were able to use their brakes, but must drive the truck or bus in a gear low enough to limit its speed. Trucks must not exceed 60km/h while descending on the South Eastern Freeway. "Too many drivers will be concerned about losing six demerits and their licence for six months so they wont dare touch the foot brake, even when they should to force the automatic gears back down when the system has changed up a gear when the gradient eases momentarily,” he said. "That will cause major safety risks and deaths. "If just one per cent of drivers of the 660,000 trucks that come down each year refuse to use their foot brake when they should, that will be 6600pa... that's 20 per day. He said the association had been debating this issue with the State Government for two weeks ever since its surprise announcement, and incredibly they were refusing to budge. "We will continue to try to get the government to understand that the wording of ARR108 dates back to before today's automatic computer controlled trucks,” he said.